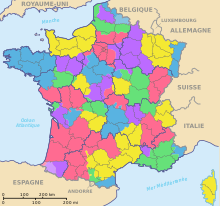 In the administrative divisions of France, the department (French: département, pronounced [depaʁt(ə)mɑ̃]) is one of the three levels of government below the national level ("territorial collectivities"), between the administrative regions and the commune. Ninety-six departments are in metropolitan France, and five are overseas departments, which are also classified as regions. Departments are further subdivided into 334 arrondissements, themselves divided into cantons; the last two have no autonomy, and are used for the organisation of police, fire departments, and sometimes, elections. Each department is administered by an elected body called a departmental council (conseil départemental [sing. ], conseils départementaux [plur.]). From 1800 to April 2015, these were called general councils (conseil général [sing. ], conseils généraux [plur.]). Each council has a president. Their main areas of responsibility include the management of a number of social and welfare allowances, of junior high school (collège) buildings and technical staff, and local roads and school and rural buses, and a contribution to municipal infrastructures. Local services of the state administration are traditionally organised at departmental level, where the prefect represents the government; however, regions have gained importance in this regard since the 2000s, with some department-level services merged into region-level services. The departments were created in 1790 as a rational replacement of Ancien Régime provinces with a view to strengthen national unity; the title "department" is used to mean a part of a larger whole. Almost all of them were named after physical geographical features (rivers, mountains, or coasts), rather than after historical or cultural territories which could have their own loyalties. The division of France into departments was a project particularly identified with the French revolutionary leader the Abbé Sieyès, although it had already been frequently discussed and written about by many politicians and thinkers. The earliest known suggestion of it is from 1764 in the writings of d'Argenson. They have inspired similar divisions in many countries, some of them former French colonies. Most French departments are assigned a two-digit number, the "Official Geographical Code", allocated by the Institut national de la statistique et des études économiques. Overseas departments have a three-digit number. The number is used, for example, in the postal code, and was until recently used for all vehicle registration plates. While residents commonly use the numbers to refer to their own department or a neighbouring one, more distant departments are generally referred to by their names, as few people know the numbers of all the departments. For example, inhabitants of Loiret might refer to their department as "the 45". The first French territorial departments were proposed in 1665 by Marc-René d'Argenson to serve as administrative areas purely for the Ponts et Chaussées (Bridges and Highways) infrastructure administration. Before the French Revolution, France gained territory gradually through the annexation of a mosaic of independent entities. By the close of the Ancien Régime, it was organised into provinces. During the period of the Revolution, these were dissolved, partly in order to weaken old loyalties. Boundaries were chosen to break up France's historical regions in an attempt to erase cultural differences and build a more homogeneous nation. Boundaries were set so that every settlement in the country was within a day's ride of the capital of a department. This was a security measure, intended to keep the entire national territory under close control. This measure was directly inspired by the Great Terror, during which the government had lost control of many rural areas far from any centre of government. The old nomenclature was carefully avoided in naming the new departments. Most were named after an area's principal river or other physical features. Even Paris was in the department of Seine. Savoy became the department of Mont-Blanc. The number of departments, initially 83, had been increased to 130 by 1809 with the territorial gains of the Republic and of the First French Empire. Following Napoleon's defeats in 1814–1815, the Congress of Vienna returned France to its pre-war size and the number of departments was reduced to 86 (three of the original departments having been split). In 1860, France acquired the County of Nice and Savoy, which led to the creation of three new departments. Two were added from the new Savoyard territory, while the department of Alpes-Maritimes was created from Nice and a portion of the Var department. The 89 departments were given numbers based on the alphabetical order of their names. The department of Bas-Rhin and parts of Meurthe, Moselle, Vosges and Haut-Rhin were ceded to the German Empire in 1871, following France's defeat in the Franco-Prussian War. A small part of Haut-Rhin however remained French and became known as the Territoire de Belfort; the remaining parts of Meurthe and Moselle were merged into a new Meurthe-et-Moselle department. When France regained the ceded departments after World War I, the Territoire de Belfort was not re-integrated into Haut-Rhin. In 1922, it became France's 90th department. Likewise, the Lorraine departments were not changed back to their original boundaries, and a new Moselle department was created in the regained territory, with slightly different boundaries from the pre-war department of the same name. The re-organisation of Île-de-France in 1968 and the division of Corsica in 1975 added six more departments, raising the total in Metropolitan France to 96. By 2011, when the overseas collectivity of Mayotte became a department, joining the earlier overseas departments of the Republic (all created in 1946) – French Guiana, Guadeloupe, Martinique and Réunion – the total number of departments in the French Republic had become 101. In 2015, the Urban Community of Lyon was split from Rhône to form the Métropole de Lyon, a sui generis entity, with the powers of both an intercommunality and those of a department on its territory, formally classified as a "territorial collectivity with particular status" (French: collectivité territoriale à statut particulier) and as such not belonging to any department. In 2018, the two departments of Corsica re-merged to form a single territorial collectivity (simultaneously region and department), reducing the number of departments to 100. The departmental seat of government is known as the prefecture (préfecture) or chef-lieu de département and is generally a town of some importance roughly at the geographical centre of the department. This was determined according to the time taken to travel on horseback from the periphery of the department. The goal was for the prefecture to be accessible on horseback from any town in the department within 24 hours. The prefecture is not necessarily the largest city in the department: for instance, in Saône-et-Loire department the capital is Mâcon, but the largest city is Chalon-sur-Saône. Departments may be divided into arrondissements. The capital of an arrondissement is called a subprefecture (sous-préfecture) or chef-lieu d'arrondissement. Each department is administered by a departmental council (conseil départemental), an assembly elected for six years by universal suffrage, with the President of the Departmental Council as executive of the department. Before 1982, the chief executive of the department was the prefect (préfet), who represents the Government of France in each department and is appointed by the President of the French Republic. The prefect is assisted by one or more sub-prefects (sous-préfet) based in the subprefectures of the department. Since 1982, the prefect retains only the powers that are not delegated to the department councils. In practice, his role has been largely limited to preventing local policy from conflicting with national policy. 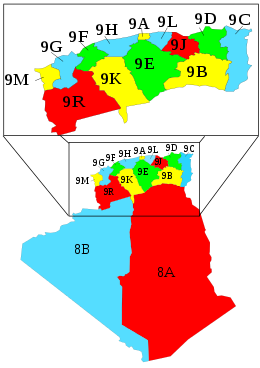 The departments are further divided into communes, governed by municipal councils. As of 2013, there were 36,681 communes in France. In the overseas territories, some communes play a role at departmental level. Paris, the country's capital city, is a commune as well as a department. 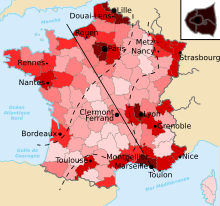 In continental France (metropolitan France, excluding Corsica), the median land area of a department is 5,965 km2 (2,303 sq mi), which is two-and-a-half times the median land area of the ceremonial counties of England and the preserved counties of Wales and slightly more than three-and-half times the median land area of a county of the United States. At the 2001 census, the median population of a department in continental France was 511,012 inhabitants, which is 21 times the median population of a United States county, but less than two-thirds of the median population of a ceremonial county of England and Wales. Most of the departments have an area of between 4,000 and 8,000 km², and a population between 320,000 and 1 million. The largest in area is Gironde (10,000 km²), while the smallest is the city of Paris (105 km²). The most populous is Nord (2,550,000) and the least populous is Lozère (74,000). The departments are numbered: their two-digit numbers appear in postal codes, in INSEE codes (including "social security numbers") and on vehicle number plates. Initially, the numbers corresponded to the alphabetical order of the names of the departments, but several changed their names, so the correspondence became less exact. There is no number 20, but 2A and 2B instead, for Corsica. Corsican postal codes for addresses in both departments do still start with 20. The two-digit code "98" is used by Monaco. Together with the ISO 3166-1 alpha-2 country code FR, the numbers form the ISO 3166-2 country subdivision codes for the metropolitan departments. The overseas departments get three digits. Originally, the relationship between the departments and the central government was left somewhat ambiguous. While citizens in each department elected their own officials, the local governments were subordinated to the central government, becoming instruments of national integration. By 1793, however, the revolutionary government had turned the departments into transmission belts for policies enacted in Paris. With few exceptions, the departments had this role until the early 1960s. Party affiliation of the General Council Presidents of the various departments in the elections of 2001. Party affiliation of the General Council Presidents of the various departments in the elections of 2004. Party affiliation of the General Council Presidents of the various departments in the elections of 2008. Party affiliation of the General Council Presidents of the various departments in the elections of 2015. The removal of one or more levels of local government has been discussed for some years; in particular, the option of removing the departmental level. Frédéric Lefebvre, spokesman for the UMP, said in December 2008 that the fusion of the departments with the regions was a matter to be dealt with soon. This was soon refuted by Édouard Balladur and Gérard Longuet, members of the Committee for the reform of local authorities, known as the Balladur Committee. In January 2008, the Attali Commission recommended that the departmental level of government should be eliminated within ten years. Nevertheless, the Balladur Committee has not retained this proposition and does not advocate the disappearance of the departments, but simply "favors the voluntary grouping of departments", which it suggests also for the regions, with the aim of reducing the number of regions to 15. This committee advocates, on the contrary, the suppression of the cantons. Each department has a coat of arms with which it is commonly associated, though not all are officially recognized or used. ^5 This department was known as Bec-d'Ambès ("Beak of Ambès") from 1793 until 1795. The Convention eliminated the name to avoid recalling the outlawed Girondin political faction. ^19 Divided into two departments (Golo and Liamone) from 1793 to 1811, and again into two departments (Corse-du-Sud, number 2A, and Haute-Corse, number 2B) from 1975 to 2018. Lyon 1790–1793 Split into Rhône and Loire on 12 August 1793. Bastia 1790–1793 Split into Golo and Liamone. Bastia 1793–1811 Reunited with Liamone into Corsica. Ajaccio 1793–1811 Reunited with Golo into Corsica. Chambéry 1792–1815 Formed from part of the Duchy of Savoy, a territory of the Kingdom of Piedmont-Sardinia and was restored to Piedmont-Sardinia after Napoleon's defeat. The department corresponds approximately with the present French departments Savoie and Haute-Savoie. Geneva 1798–1814 Formed when the Republic of Geneva was annexed into the First French Empire. Geneva was added to territory taken from several other departments to create Léman. The department corresponds with the present Swiss canton and parts of the present French departments Ain and Haute-Savoie. Nancy 1790–1871 Meurthe ceased to exist following the annexation of Alsace-Lorraine by the German Empire in 1871 and was not recreated after the province was restored to France by the Treaty of Versailles. Paris 1790–1967 On 1 January 1968, Seine was divided into four new departments: Paris, Hauts-de-Seine, Seine-Saint-Denis, and Val-de-Marne (the last incorporating a small amount of territory from Seine-et-Oise as well). Was department number 75. Versailles 1790–1967 On 1 January 1968, Seine-et-Oise was divided into four new departments: Yvelines, Val-d'Oise, Essonne, Val-de-Marne (the last largely comprising territory from Seine). Was department number 78. Ajaccio 1811–1975 On 15 September 1975, Corsica was divided in two, to form Corse-du-Sud and Haute-Corse. Was department number 20. Saint-Pierre 1976–1985 Saint-Pierre-et-Miquelon was an overseas department from 1976 until it was converted to an overseas collectivity on 11 June 1985. INSEE code 975. Ajaccio 1975–2018 Reunited with Haute-Corse into Corsica. Was INSEE code 2A. Bastia 1975–2018 Reunited with Corse-du-Sud into Corsica. Was INSEE code 2B. 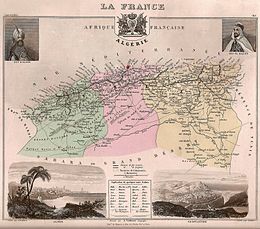 Unlike the rest of French-controlled Africa, Algeria was divided into overseas departments from 1848 until its independence in 1962. These departments were supposed to be "assimilated" or "integrated" to France sometime in the future. Where a Napoleonic department was composed of parts from more than one country, the nation-state containing the prefecture is listed. Please expand this table to list all countries containing significant parts of the department. 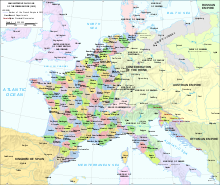 Territories that were a part of Austrian Netherlands were also a part of Holy Roman Empire. The Bishopric of Basel was a German Prince-Bishopric, not to be confused with the adjacent Swiss Canton of Basel. Maastricht was a condominium of the Dutch Republic and the Bishopric of Liège. On 6 June 1805, as a result of the annexation of the Ligurian Republic (the puppet successor state to the Republic of Genoa), Tanaro was abolished and its territory divided between the departments of Marengo, Montenotte and Stura. Before becoming the department of Apennins, the Republic of Genoa was converted to a puppet successor state, the Ligurian Republic. Before becoming the department of Arno, the Grand Duchy of Tuscany was converted to a puppet successor state, the Kingdom of Etruria. Rome was known as the department du Tibre until 1810. Before becoming the departments of Bouches-du-Rhin, Bouches-de-l'Escaut, Bouches-de-la-Meuse, Bouches-de-l'Yssel, Ems-Occidental, Frise, Yssel-Supérieur and Zuyderzée, these territories of the Dutch Republic were converted to a puppet successor state, the Batavian Republic (1795–1806), then those territories that had not already been annexed (all except the first two departments here), along with the Prussian County of East Frisia, were converted to another puppet state, the Kingdom of Holland. Before becoming the department of Simplon, the République des Sept Dizains was converted to a revolutionary République du Valais (16 March 1798) which was swiftly incorporated (1 May 1798) into the puppet Helvetic Republic until 1802 when it became the independent Rhodanic Republic. In the months before Lippe was formed, the arrondissements of Rees and Münster were part of Yssel-Supérieur, the arrondissement of Steinfurt was part of Bouches-de-l'Yssel and the arrondissement of Neuenhaus was part of Ems-Occidental. 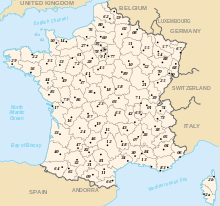 Wikimedia Commons has media related to Departments of France. ^ Masson, Jean-Louis (1984). "Provinces, départements, régions: L'organisation administrative de la France d'hier à demain". Google Livres (French Google Books site). Éditions Fernand Lanore. Retrieved 15 July 2017. ^ See Provinces of the Netherlands for the annexed Dutch departments. ^ "La fusion département-région n'est pas à l'ordre du jour". L'Express. Retrieved 21 July 2011. ^ a b "Les 20 propositions du Comité (20 propositions of the Committee)" (in French). Committee for the reform of local authorities. Retrieved 11 November 2009.